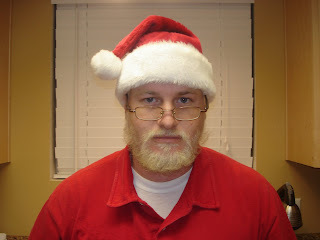 Cody had been growing out his beard for 2 months, so we decided that it would be funny if we bleached his hair and beard to see if he would look like Santa Clause. 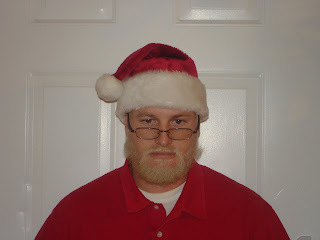 Although his hair wasn't white I think with his glasses (that he never wears) he actually does look a little like Santa. We spent Christmas with Cody's family this year at Lake Havasu. It was fun to see their expressions when everyone got there. Hope everyone ejoys the pictures. 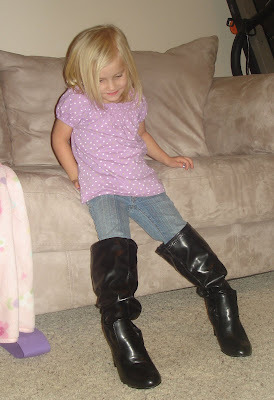 These boots are made for walking, I think! 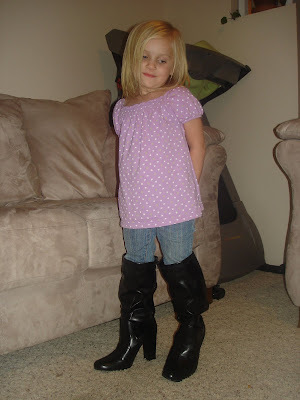 Cadence found some of my boots and thought it so much fun wearing them around even though she could barely walk. We were both laughing! Our visit the the E.R. On Saturday night we took Kyndee into the E.R because she had a pretty high fever. On Friday night it was a 104. We were able to bring it down, but it kept coming back up, even with medicne. We were concerned because of her recent surgury and didn't know if it had anything to do with the fever or not. I called my brother who works in the E.R. to ask him what he though we should do. He said he thought we should take her in. Anyhow he called us back and told us he called and talked to one of the E.R. doctors and they though she needed to been seen with her recent surgury because she could have infection with that high of a fever. I feel so lucky to have an awesome brother who is so knowledgeable with medical stuff. I am constantly calling him to ask him what I should. Anyhow Cody's Dad came and got Cadence so she could spend the night over there. We went into the E.R. about 10 pm and they knew we were coming. They were so nice to us. The doctor told us that they might have to do blood test to test for infection and maybe other test. We were glad that they soon found out it was strep throat. 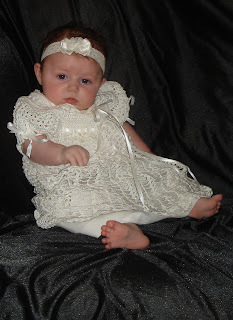 They had to test it to make sure and then give her a shot (antibiotics), then they gave us a prescription. It was definently a long night! We didn't get home until about 1:30 am. 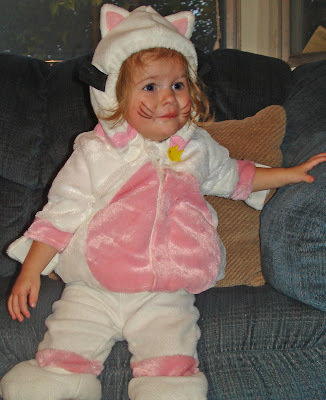 Then I had to get up at 4 and 8 to give her tylenol for her fever. What a crazy night. I hope that we don't have anything crazy happen for a while. I though I was going to have a panick attack on the way to the E.R. I think there has just been so much going on lately. And we are keeping our fingers crossed that Cadence doesn't get it. 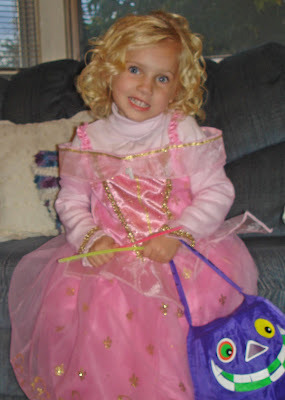 I have been meaning to post Halloween pictures, but I just haven't got it done. So here they are finally. 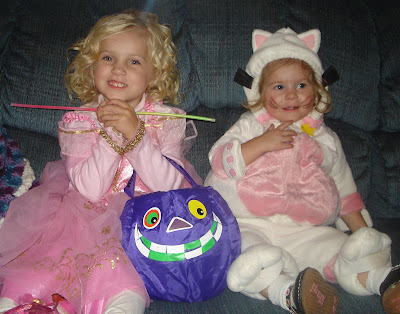 Cadence was sleeping beauty and Kyndee was a cat. 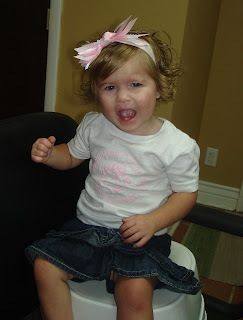 Kyndee's surgery went well, and she is doing just fine now. The sore in her mouth was worse than we had expected. One of her front teeth was completely dead and was starting to rot the bone. So they had to pull out her tooth, so she'll be without one of her front teeth until the other one comes in, which will probably be about 7 or 8 years old. They had to scrape away all the infected and inflamed tissue on her gums and scrape around the bone. We are just glad everything went well and she is doing well. We had a wonderful doctor, who kept us very informed and keeps checking on us. Although it was minor is was hard on all of us and very tiring. Kyndee was pretty upset coming out of the anesthesia, which they say is normal. Once we got her home and she got some food and a nap she was doing much better. Thank you to everyone who was praying for us and concerned! We greatly appreciate it! We are thankful for wonderful family and friends! Just wanted to let everyone know that Tomorrow (Monday), Kyndee will be having surgery. She has a sore in her mouth caused by something she ate. Something got stuck in her gums and then got infected. Then it started getting bigger and more puffy and kept bleeding more. And after seeing the dentist, our doctor, and a pediactric dentist, they decided she needed to have surgery and cut out the growth in her mouth and scrape all the inflamed stuff out. She will be under anesthesia because they think there will be a lot of bleeding and also so she is not screaming. I guess this is not new to us since she had surgery a few months ago because of a blocked tear duct. We will be glad when the surgery is done. I'm hoping she doesn't have to have another surgery for a long time. I was just wondering if anyone has any tips on getting rid of cankers sores. I have had one for a couple of days now and it is driving me nuts! I have tried baking soda and it helps a little and hurts like heck! Do anyone have something better? I would love to hear if have any other advise besides that. 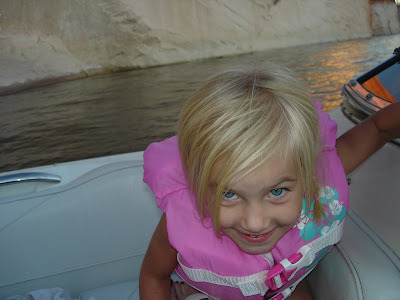 This was from when we went camping at Lake Powell. 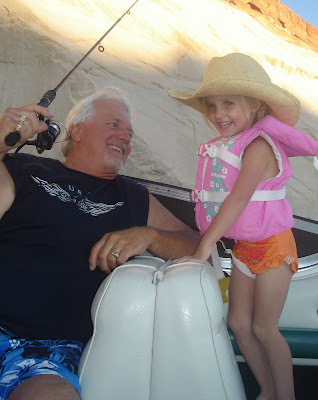 Cadence got to go fishing with her Grandpa and Dad. 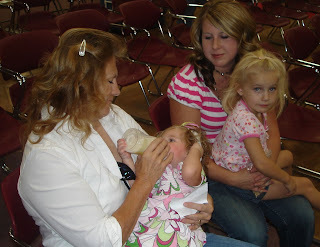 She loved spending time with them. This is for everyone that has tagged me lately, sorry I have been a total slacker! If I missed anyones tag please let me know so I can add it to my lengthy list! I got tagged by Meridith (my cousin), I'm supposed to list 6 quirky things about myself. * I hate taking pills (I don't think I could ever be an addict, I gag every time I take a big pill). * I like to yell at stupid driver even though they can't hear me. Sadly Cadence is learning the word idiot. And we won't mention the other word I say when there is a stupid driver that cuts me off or something. Starts with an S.
*I can't stand when the toilet paper roll is backwards. It drives me nuts! *I color coordinate my clothes in my closet as well as everyone else in my house. *Sometimes I don't get jokes! Some people call it airheaded, I like to think of it as innocent though. LOL! Ok, maybe I am a little bit. *Sadly sometimes I have a bad impression of a person the 1st time I meet them, then later I end up liking them. I've been tagged now your it! Favorite Shoes: honestly my flip flops are probably my favorite pair of shoes that I have. Favorite Room: My kitchen since we just got it redone not too long ago. I love my cabinets and counter tops. Favorite Soda: Sprite, I know I am weird, but I don't like most sodas. Especially pepsi and coke. Favorite Past time: taking pictures, watching movies with my honey, and being with family and friends, and going for walks. Favorite Household Chore: I don't think I have a favorite, I love doing laundry because it makes my clothes smell good, but I hate folding them. Favorite Car: I always wanted a spider or a jeep. I also really like the Mazda 6's, although I don't think I would buy one with my kids. Not enough room. Favorite Time of Day: when my kids go to sleep at night. Now I tag everyone on my family and friends list or everyone else that I didn't already tag. 4th Picture of 4th Folder... 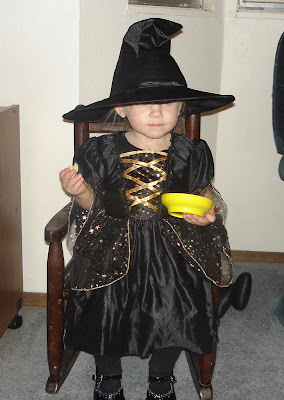 This is Cadence on Halloween 2006, I love her witch costume. 1. Go to Your Pictures. 2. Upload 4th Picture of 4th Folder. 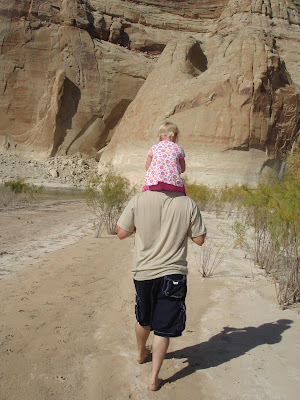 Last weekend we went camping at Lake Powell with Cody's parents. It was lots of fun, although I am very thankful to have my own bed and a shower and my bathroom back. The kids had lots of fun too. Cadence and I got to take a walk along the shore while Cody and his Dad played frisby golf, and Cody's Mom watched Kyndee. It was so nice to get away, especially since Cody just got back last Wed. from Texas. He was gone for 2 1/2 weeks. I couldn't believe how warm it was there, except for night. It was perfect weather. The top picture is Cody and Cadence. Cody came and met us on our walk after his game. 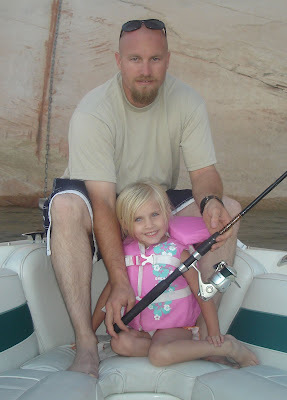 And the 2nd picture is when we went fishing. Well, Cody and his Dad went fishing and Cadence and I watched, actually I think I fell asleep. They didn't catch anything though. 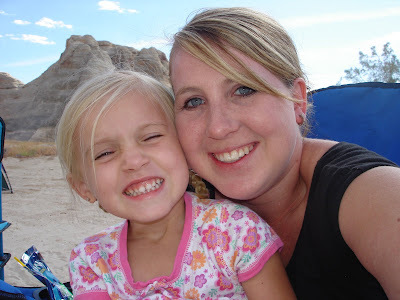 And the last picture is of me and Cadence hanging out at our camp. 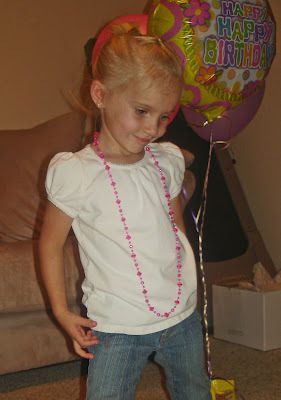 Cadence's 4th birthday was on October 13th. We had a family party for us on my birthday and celebrated my Dad's, mine, and Cadence's birthdays. 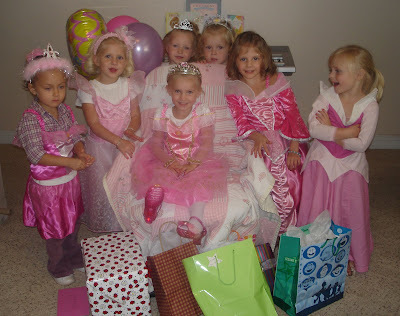 Then on her birthday we had a few of her friends over for a princess party. She loved it! 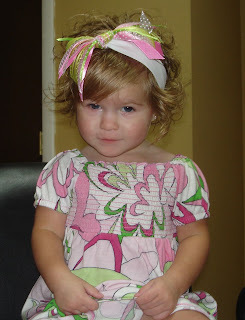 I can't believe that she is 4 years old. 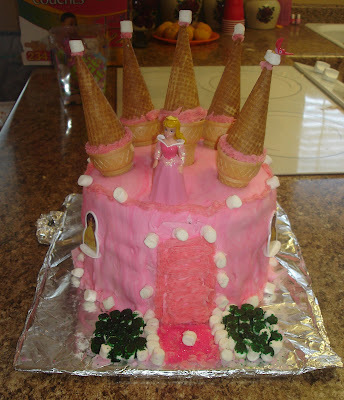 My best friend Summer made the cake for us. I can't believe what an awesome job she did. Do you want to save money on groceries? Tonight I had a lady come and teach a class at my house about how to save money on groceries. 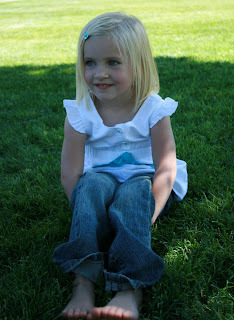 There is a website online called grocerysmarts.com they have most of the grocery stores in Utah on there. They have lists that you can print out of each store and the weekly sales they are having. So you look at the list and combine coupons that you get out of the Sunday paper or some you can print online. It save you a ton of money. They had a deal a few weeks ago for electrosol tablets. They were on sale and then you used a coupon and they came up to only 9 cents a box. Crazy huh! Anyways check out the website! It is helping me save lots of money on our groceries. Who doesn't want to save money on groceries anyways! Cadence had her friends Lindsey and Logan (who are twins) over to play a few weeks ago and I have been meaning to post pictures of when they dressed up. I felt bad I didn't have anything for Logan to dress up in. So we got a pictures of him, but he didn't want to be in the picture with the dressed up girls. 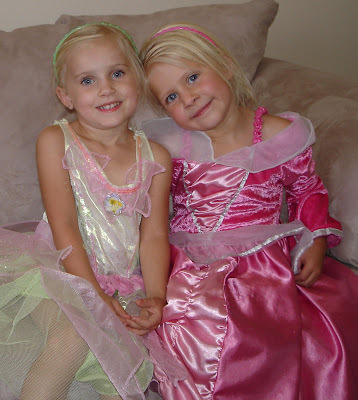 I think these kids are so cute! 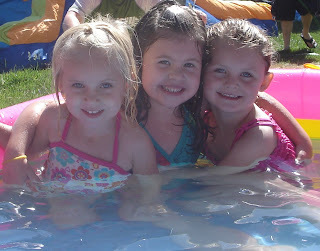 Cadence loves having her friends over to play! It's been forever since I posted. The other day we were out in our front yard and I thought I would take some pictures. 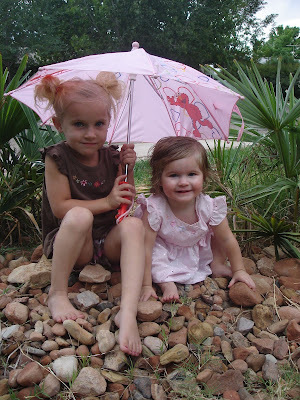 Cadence just loves her little umbrella that her Grandpa got for her. 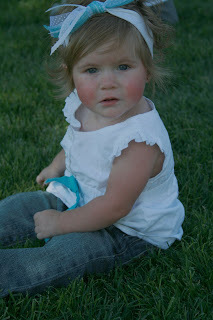 I have some cousins that are doing a year of photo's. Each day we will post a new picture. I think it's a great idea and I do enjoy taking pictures. Now maybe I'll take more pictures. Sometimes I just forget. I am excited about this! Thanks Lauren! 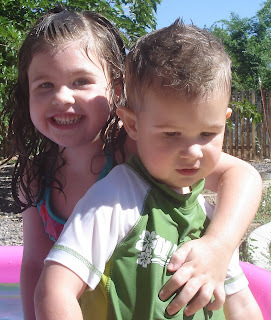 I got another blog for this so go to jillsyearofphotos.blogspot.com and check it out. I just finish the 2nd book of the Twilight series. I can't believe how addicting they are. I decided when Cody was gone I would get Twilight. Half way into that one I had to buy the second book. I will for sure be going to see the movie. I just hope that I am not dissapointed, everyone always says books are much better than the movie. I hope that I like the 3rd and 4th books just as much as I did the first two. If you have read them let me know your opinion, but please don't give anything away. 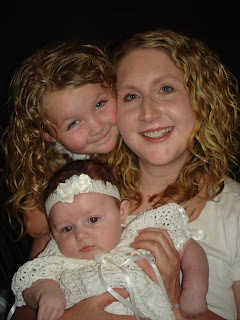 Kassie Lee will be remembered as being a wonderful mother. 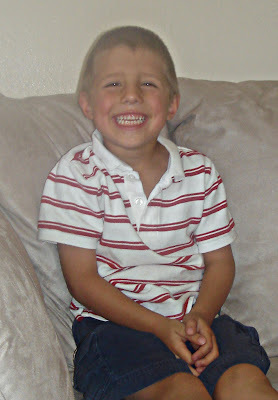 Her 8-year-old son, Jerym, will be remembered as a sweet, loving child who enjoyed sports. One day after a crash took their lives, family members gathered to share their memories. Kassie was such a sweet girl, I was so sad to hear the awful news. When we were younger she lived just down the road from me and we grew up together. As kids we played together lots. My heart goes out to hear family. Her brother Adam works with my brother Corey and when hearing the horrible news, Corey went and spend most of the day at the hospital with their family for support. 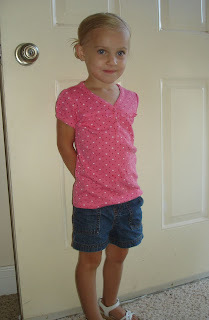 This was Cadence's 1st day of preschool. 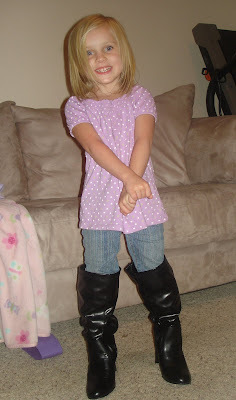 She was so excited to go to school. She was wondering where the bus was, but I had to explain to her that she doesn't ride a bus, Mommy gets to take her. 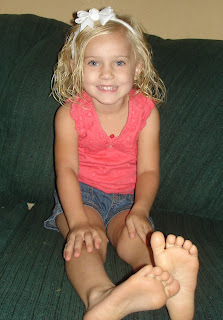 She is friends with all of the kids in her class, they are in her sumbeam class in primary. She started on Tuesday and goes Tuesdays and Thursdays. She was so excited when Grandpa picked her up the first day. 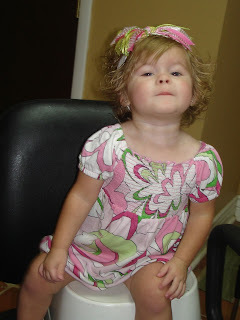 She growing so fast I can't believe that she is going to be 4 soon! The top picture is me and Kyndee up on stage for the baby contest. The bottom picture is Cody's Mom with us waiting for the contest to start. I know I don't look thrilled, but I was enjoying it. We were trying to get Kyndee to be happy. 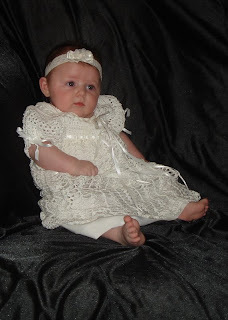 I put Kyndee in the baby contest at the fair, and it was lots of fun. I wasn't going to, but then Cody's parents talked me into it, and also I decided I should put her in since I had put Cadence in when she was younger. I was so excited when I got a call saying they wanted us to come back for the finals on Saturday. She ended up getting 2nd place in her age group. The pictures in the white shirt is what all the babies had to wear the first day. At the final competition. The could wear whatever, but it was suppose to be casual. I found the dress she is wearing at Old Navy. It was so much fun getting her ready for the contest! I loved it! Can you tell she has attitude? She makes me laugh. 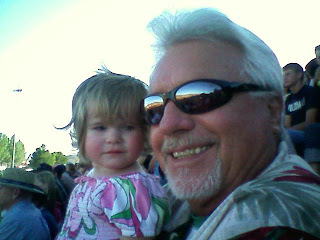 Cadence had fun too, while the competition was going on Grandpa took Cadence to one of the bounce houses. She loved it! 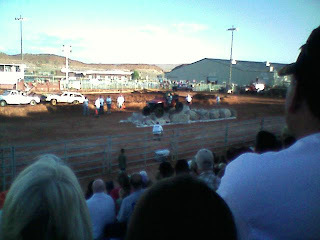 We went to the fair over the weekend and had a great time! 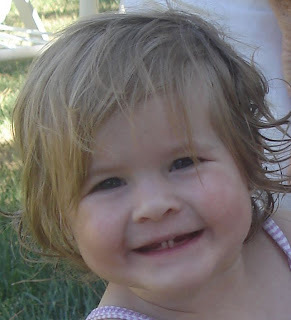 We got to take the kids on lots of rides, and go to the demolition derby (that was tons of fun), watch fireworks, get the kids id cards and fingerprinted ( the police were doing that), we ate lots of yummy food, and even put Kyndee in the baby contest. Although I was bummed that Cody was gone, we still had a great time. Cody's parent came with me and the kids, and my parents came for a while also. It was so nice to have help with the kids. Cody is working in Washington State for the next 2 weeks. 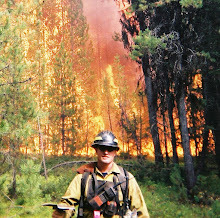 He is working with a helicopter and crew on a fire. He sent me these pictures so I thought I would share them. I think that it is a beautiful place. I hate to have him gone, but thats his job, and I know he is working hard to support our family. The top pictures is the lake where the helicopter gets water to dump on the fire. 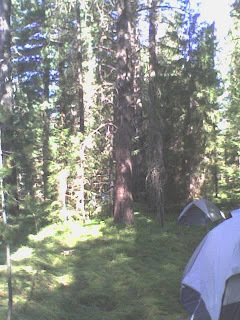 The bottom picture is of their camp. So my sister ask me to take some pictures of her and the kids the other day. So I did, I think they turn out pretty cute. I am not at all a photographer, but it was sure fun. Cody even took a few turns going down the slide, it was pretty funny. 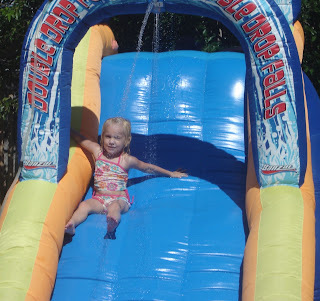 We had a fun 24th of July! In the morning Cadence and I got to be in the parade with our wards primary, while Cody and Kyndee watched with my parents. 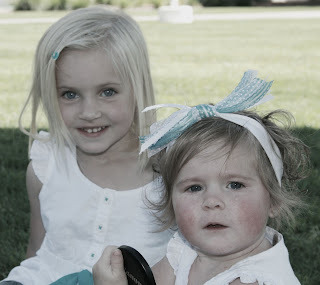 Cadence got to ride in a little wagon with her friend Lindsey. After the parade, we came back to the house to have a BBQ and to let the kids play in the water. 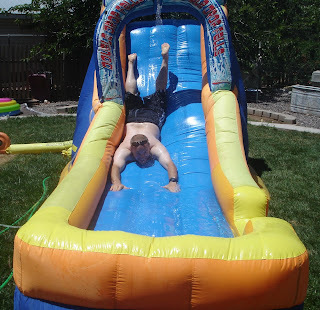 My Sister-in-law brought her big blow up water slide and I got a slip and slide. The kids had so much fun! 1. As a comment on my blog, leave a memory that you and I had together. It doesn't matter if you knew us a little or a lot, anything you remember, good or bad but be nice! Not much is going on around here. Cadence came down with a cold on Monday and now of course we all have a cold. She caught it from her cousin of course. I hate having a cold in the summer. My parents a.c. unit went out in there house, so they came to stay with me. My Dad only stayed for one night, but my Mom stayed for 3 nights. It was so much fun having them here. I was so glad we got to spend so much time with my Mom. She is a wonderful Mom! And she was so helpful too! On the 4th of July we went to watched the parade. It was pretty sad! It lasted all of mabey 10 minutes. The highlight was that Cody got to drive the Hummer for the BLM in the parade. Smokey the bear followed right behind in one of the firetrucks. Cadence is still terrified of Smokey the Bear. She kept covering her eyes when he passed by. We got to go have breakfast with Cody and all of the fireguys. Cadence became buddies with Clark, one of the guys Cody works with, it was so cute. She sat by him the whole time at breakfast. After having breakfast, we went to my parents house to let the kids play. 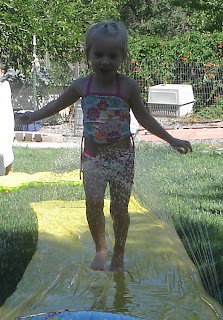 My sister-in-law, Crystal brought a huge water slide for the kids to play on. They had a ton of fun although we felt like referee's. After playing on the waterslide and having lunch, we met up with my friend Julia and her kids. 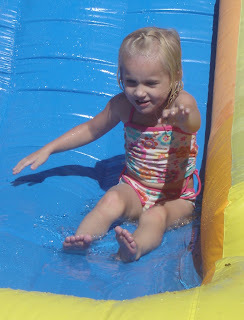 We went to her parents house and got to go swimming. 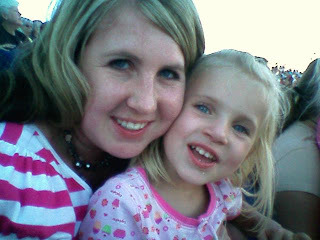 We finished up the night by going to Baskin Robbins and having ice cream and watching the fireworks with Julia's family. They were so sweet to let me and the kids hang out with them. Cody and Julia's husband works together, so we hang out together a lot. I am so thankful to have such a great friend that understands and listens to me complain when my husband is gone. Thank You Julia! 1. I was working @ Polo Raulph Lauren. 2. That was when I started dating Cody, was 10 years ago. Crazy I know! And we were together most of the time. 3. Hanging out with friends when I was not with Cody. 4. Ditching school every now and then so that I could hang out with Cody. My parents thought we were together too much, so they would try to limit our time together. I just told them I was going to the store. I'm sure they wondered why I went to the store so much. 1. Cody and I had been married for 2 years already and we were trying to get pregnant. It took us a year 1/2 to finally get pregnant. 2. I had just started working @ Regis in the mall doing hair and I loved it there! 3. I was cleaning my house on my day off. Wow those day before I had kids, I can't believe how much I actually got done. 4. 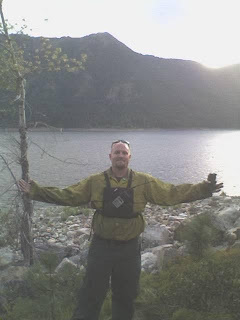 I was hanging out with my family a lot because Cody was going on his second season as a wildland firefighter. I hated being home alone. Now I guess I am kind of use to it, although I do have to kids now so I am not alone I guess. 1. I was cleaning up throw up, somehow Kyndee came down with something, not fun at all! Well, that was last night. 2. Went to my brother's and nephews Birthday parties. 3. Went to Walmart to get a few things. 4. Got to visit with my friends at my house before they went back home to Salt Lake. Today is Cody's 29th birthday. Happy Birthday Honey! He had to work all day, so we were sad that we didn't get to celebrate with him today, but we did have a family party the other day! I keep teasing him that he has one more year before he turns old. LOL! He got called out on a fire this evening, but I am sure that he doesn't mind. I heard that his crew got a cake for him today. I really think that was nice of them. 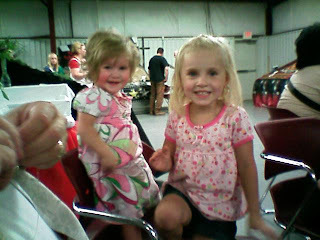 I forgot to take pictures @ the party so I found a cute picture of Cody and Cadence. We love you Cody! Happy Birthday! We hope your day was great! Love, Jill, Cadence, and Kyndee. 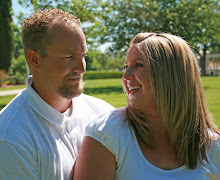 I am so excited we finally got some new family pictures. 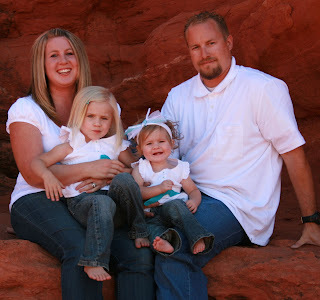 The last time we got family pics was when I was 6 months pregnant with Kyndee. 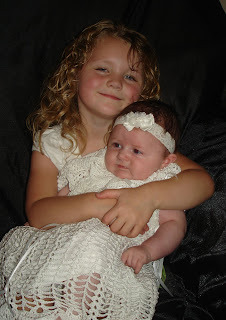 Our girls are growing so fast. I hope you enjoy the pictures. 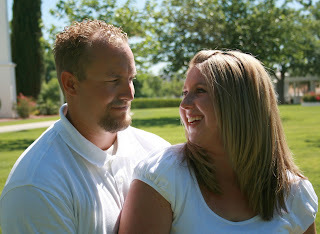 My friend Megan did the pictures for us. I think she did an awesome job! Thanks Megan!